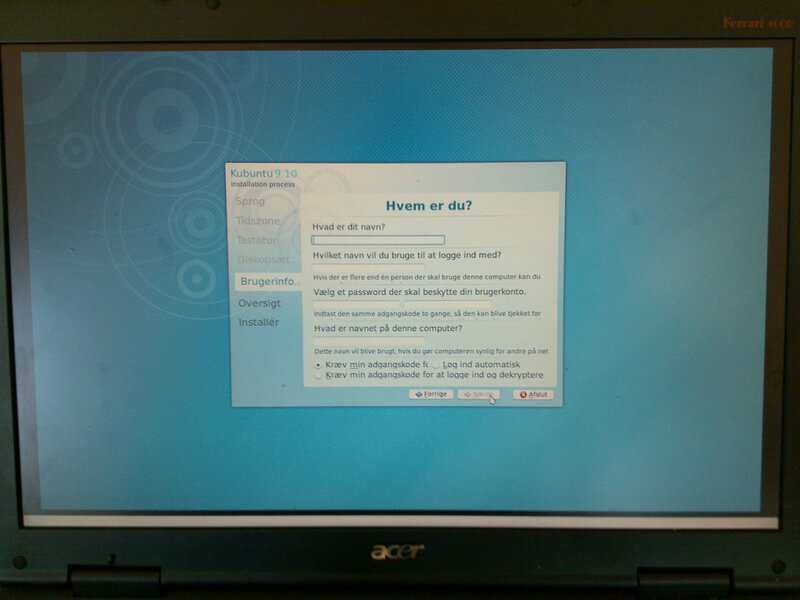 During a danish installation of Kubuntu Karmic Koala, The user information tab does not show all text on all text fields. 1) The text on the tabs "Diskopsæt..." should be displayed in full like "Diskopsætning", the same holds for "Brugerinfo..." which should display "Brugerinformation"
2) The sentence "Hvis der er flere end en person der skal bruge computeren kan du" (en: if there is more than one person that shall use the computer, you can) apparantly continues on a second line, which is not shown except from the top pixels of some of the letters. 3) The sentence "Indtast den samme adgangskode to gange så den kan blive tjekket for" (en: enter the same password twice, so it can be checked for) apparantly continues on a second line, which is not shown except from the top pixels of some of the letters. 4) The second bottom line says "Kræver min adgangskode fo...", which is a danish translation from (I guess) "Require my password to ...", bu tthe rest of the sentence is not shown. Which makes the default chosen option an unknown choice. Assigning this issue to the Danish translation team, so that they can better comment on this issue. These are programming bugs, to either make sure that the GUI behaves nicely with text strings of different lengths or to alert the translators of limited space. Marking as invalid for ubuntu-l10n-da. This was reported against Karmic, but since then the installer has undergone some major changes, and this bug might not even apply anymore to the current development release. Could someone test if the problem is still present in the Maverick installer? I'm reopening the translations task. It was assigned to the Danish translators because although a bug in Ubiquity, it manifested itself in the Danish translation. Danish translators: I'm leaving assigned it to you in case you want to test it with the new installer. Otherwise, feel free to remove the assignment to ubuntu-l10n-da in the bug. This appears to have been solved, although some lines are now nolonger translated. But the name of the installation step i still cut of. it should say "Brugerinformation" but only "Brugerinformati" is displayed. Maybe we could translate it to "Brugerkonto" (User account), or make it simply "Brugerinfo". Ajenbo has confirmed that this is still an issue. Confirming for ubiquity and marking as invalid for ubuntu-l10n-da. @Ajenbo I changed it to "Brugerinfo" but only because we are so close to release. Since there are no comments telling us to restrict ourselves to a certain number of characters this really is a GUI issue and hence an program bug, not a translation bug. PS: I found the string in the ubiquity-debconf packaged to be exact. As far as I am concerned this is fixed as a translation issue, but remains as a programming issue. So I'm removing ubuntu-l10n-da as assignee for the translation bug, so It'll no longer appear on lists for ubuntu-l10n-da bugs.